Centrally located in the heart of Southern acces of Hue City, near the Ngu Binh Water Park, on the way to Phu Bai airport. 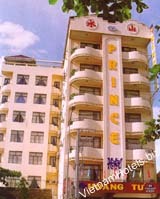 Prince Hotel offers visitors an ideal acces to places of tourist interest and famous landcapes of Hue - the old charming capital. Our friendly experienced staff is well trained to assure visitors a comfortable, interesting and unforgettable stay in a truly Hue.